Today is Remembrance Sunday and all the wonderful tributes that have taken place are both uplifting and sobering. Daffodils is my tribute to the fallen of WW1 but in a way, it's a homage to any person who died trying to save their country and loved ones from oppressors. The world is less certain than it has ever been in my lifetime and so I'm honouring those generations who gave their lives so that we might live in freedom. 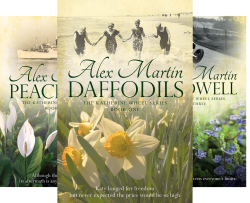 Daffodils is currently #free and anyone is welcome to download my take on the war that was supposed to end all wars.